We're Awakening! : Switchfoot on the Tonight Show with Conan O'Brien tonight! Switchfoot on the Tonight Show with Conan O'Brien tonight! Tune into The Tonight Show with Conan O'Brien on Wednesday December 2nd to see Switchfoot perform live. 11:35 pm EST / 10:35 pm CST on NBC. ^Be sure to set your DVR's or Tivo's! Also, management tells us that "Hello Hurricane" is in great shape, in terms of album sales, and that they are very excited with how things are going right now for Switchfoot. "Mess of Me" is also sitting very well right now in terms of expectations, and we also expect a rebound once Thanksgiving weekend sort of wears off. 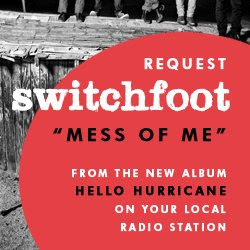 The most important thing to do right now, as fans, is to continue to work the phones and request "Mess of Me" at our local rock stations, and to tell your friends to come out with you to the shows on the Hello Hurricane tour! Let's do this! Also, again, check out the TV spot of "Bullet Soul" as the theme song on the WWE's latest spot. ^Again, awkward placement... but I'm still loving the exposure! Keep it up guys! We're doing a great job and are really making a difference! We have some new voting links. To make things easier for you all, we are going to mark the priority links with a "P"
Again, please also go here to see a list of stations already playing "Mess of Me" and phone numbers to call in and request the song with!! This is our time to shine, friends!